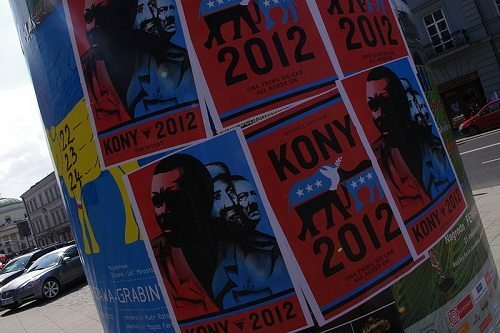 My First March: In 2013, Who Still Cares about Kony 2012? Remember Kony 2012? The online video from Invisible Children drew more than 100 million views last year, but despite the big viral smash, the turnout wasn’t quite so smashing for the subsequent “cover the night” events. Then came charges that Invisible Children’s most visible leader, Jason Russell, was a fundamentalist Christian or a pawn in a Western scheme to control Uganda, along with questions about whether the video’s titular warlord, Joseph Kony, and his LRA warranted the national or international attention. There was also Russell’s public breakdown, an unfortunate incident that caused some otherwise sympathetic observers to write the organization off. All of this happened just last year, yet the public’s fascination with Invisible Children has largely faded away. What hasn’t faded, however, is the loyalty of a significant number of young people who saw themselves as part of a social movement tied to Invisible Children, regardless of the critics. Late last year, many of these young people gathered for a rally in Washington, D.C. that drew leaders from several countries—as well as U.S. Assistant Secretary of State Johnnie Carson—who spoke in front of a very large audience of Invisible Children acolytes to answer questions about their continuing commitment to bring Kony to justice. After the gathering at the Washington Convention Center, the Invisible Children adherents, clad in red T-shirts, marched to the White House to demonstrate to President Barack Obama that they were still a force to be reckoned with. They ended their event with a dance party, which seems to be a staple of the Invisible Children organizing model. NPQ contacted several people who were identified based upon their having sent multiple tweets to people at Invisible Children or to their peers describing their participation in Invisible Children’s November 17, 2012 MOVE:DC rally in Washington, D.C.
A note on methodology is in order. NPQ conducted interviews with these young people via Skype chat. In this era of social media, it is important to note that it is impossible for NPQ to verify that all of the interviewees who responded to questions are who they say they are. That said, these interviewees were selected by NPQ and we feel confident in the authenticity of their identities We must also note that none of those interviewed requested anonymity, but because most of them are very young, NPQ will use only their first names. So who are these young believers in the Invisible Children movement? What motivates them? Lauren is an 18-year-old high school senior from Richmond, Va. For her, part of the attraction to the Kony issue is the clarity of the issue in taking aim at a criminal. It doesn’t require the complexity of trying to figure out what to do about Assad in control of a military regime in Syria or sorting out the complex tribal and religious issues raised by the Tuareg peoples in Chad, Mali, and Algeria. For Lauren, “this situation is unique in that it is small and rather uncomplicated. You don’t need to know a whole lot to understand the situation. In addition, IC has made this conflict very accessible, [as in] ‘Here’s what’s wrong, here’s exactly what YOU can do.’” It’s one man. Lop him off from his army, and it’s over—well, except for the next Kony to pop up, but many of those interviewed intimated that catching and trying Kony set an example. That is, Kony’s capture would not just bring a warlord to international justice, but would also mobilize an international movement like Invisible Children to do the same to Kony’s successors. “I think that every time a person does this it changes them a little more into the kind of person who will benefit the world as a positive, active participant,” Jason said. More specifically to the MOVE:DC event, however, Jason notes, “Kony has been running around ruining people’s lives for such a ridiculously long time. And why have his followers diminished?…it seems to me it is directly because of the efforts of everyone who has chosen to get involved.” This was Jason’s first march, but he indicated that he thought the march was incidental to the summit with the government officials. Matt is a 17-year-old high school senior from West Virginia who was motivated to participate in order to “witness history.” Matt wrote, “How can ONE man control a ‘tiny’ army and cause chaos like that in Africa and have other nations do nothing.” Like Kelsey, Matt had a friend who was president of the Invisible Children club at his high school. When Matt’s friend graduated, he took up the mantle, raising $5,000 for Invisible Children’s plan to build radio towers in Uganda that would be used as an early warning system to report on and track LRA violence. Like Kelsey, Emily is from Fairfax, Va. She is a senior in high school and considers herself “an advocate for global peace and a messenger of love.” Emily states, “Kony no longer has any political aim. He is killing people for the sake of killing and so that he isn’t caught. IC brings everyone together, of every religion, race, political views, and age to bring peace to a place that is suffering from meaningless violence.” Emily’s read on the summit part of the event was that the government speakers were merely telling the audience what they wanted to hear. However, she saw value in leaders having made public statements about Kony to 12,000 Invisible Children marchers in that those statements could be used to press those leaders for action later on. The youngest person we interviewed, Maddison is a 14-year-old from Upstate New York who explains that “singing is [her] life.” She came to D.C. with a party of 40 other students who were selected by their schools after submitting essays. Maddison said she rewrote her submission seven times. Maddison shared some of Emily’s concerns about the governmental speakers, suggesting that the speakers may have been “misleading… saying they are going to do all these things but I have my doubts.” Nonetheless, like Emily, she saw their public statements as commitments that the Invisible Children movement could get them to live up to and implement. Ellen is an 18-year-old from Texarkana, Texas who is attending college in Shreveport, La., where she is a sophomore studying creative writing. Ellen was concerned that MOVE:DC didn’t receive the attention it deserved, but she is sure that the march made history and she contrasted it with demonstrations on the “life/choice argument, gay rights, [and] wealth,” parenthetically describing the latter as “Occupy,” all issues that might be encountered in the communities in which they live and the schools they attend. Like Lauren, Ellen views Kony as “the world’s number one bad guy.” And like Jason, the statement of an International Criminal Court representative at the event impressed her; the ICC rep said that once Kony is caught, he will be put on trial. She expressed appreciation for due process and justice even for someone widely seen as a murderous maniac, which was striking and admirable. Although Ellen first encountered Invisible Children when she was in middle school, she became involved upon going to college, where she found a Schools for Schools chapter. Schools for Schools is one of the school-based clubs in the Invisible Children network; each chapter raises money for a partner school in Africa. Like others, Ellen’s club raised a few thousand dollars for Invisible Children through bake sales, Christmas caroling, and hosting screenings of the videos. “Safe” Protests: No Risk, No Reward? For most of these young people, MOVE:DC was not only their first substantial engagement with Invisible Children, but also their first exposure to a demonstration or protest march of any sort. This is evident in their expressions of awe about the sea of people in red T-shirts, something that might not be as impressive to those with a history of marching, protesting, and calling government officials to account. Nearly everyone we interviewed referred to a desire to be part of a moment in history or to “make history.” Everyone described MOVE:DC with the purest of underlying motives. These young people showed up for a cause that was distant from their own lives. This was about Africa, not their own self-interest, and it was about Joseph Kony, whose evil nature and deeds couldn’t be debated. For nearly all of those that we spoke to, this was also their first exposure to government representatives and international bodies. Across the board, they seemed impressed with Invisible Children’s capacity to garner participation from the ICC, the United Nations, and government representatives from Uganda, the Central African Republic, and South Sudan in order to discuss what is being done to catch Kony. But what, if anything, will Invisible Children’s supporters evolve into, particularly if Kony eventually does wind up before the ICC in The Hague? A movement? Unlike the political themes of the Tea Party and Occupy Wall Street, these Invisible Children young people don’t appear united by an ideology. True, they developed a sense of connection and togetherness, bound by friendships and, in the Invisible Children organizing model, social events like parties and dances. But at its core, the MOVE:DC event was about eliminating an international criminal and staying on the case until Kony is captured. The bigger issues in sub-Saharan Africa—rampant poverty, disease, and unemployment—found no mooring among the group. There is no desire to fight against government encroachment, like with the Tea Partiers. There is no advocacy for breaking the economic and political dominance of the top one percent of the U.S. population, as with the Occupy encampments. Capturing Kony is a mission, but there is no heavy cause, no ideological tract that unites the young people we interviewed. As such, no matter what the motivations might be of the people at the top of Invisible Children, the MOVE:DC event represented a new sort of protest—safe, congenial, collegial. There was no risk that demonstrators might find themselves tear-gassed for protesting a murderous African warlord like Kony. There was no risk of such a narrowly focused gathering mixing the Kony message with other issues. For these young marchers, there was no risk that the event might rattle or annoy people of sharply divergent political perspectives. And there was certainly no risk that the march would terribly unsettle the marchers’ lives. Instead, it was a feel-good march, and everyone involved knew that they could go back home, go to school, and maybe do some fundraising for Invisible Children at their convenience. But everyone would go on with their lives. In the case of a criminal warlord like Kony, no negotiations will bring him to the table with the countries he is terrorizing. There are no concessions possible for a thug like Kony, who has no real agenda of political or nationalist aims. To that extent, there is no arguing with the legitimacy of these Invisible Children devotees’ aim of seeing Kony captured and brought to trial. It is a movement, however, predicated on a clear and narrow focus on this one personification of evil who must be brought to justice. It does not get into the more complex and messy issues that undermine progress in sub-Saharan Africa or any other place where the problem cannot be boiled down to a face and a name that can be plastered on posters that cover the night.